On December 17, 2018, two Chicago police officers were struck by a Metra train and killed. Police allege that they were pursuing Edward Brown, a 24-year old Black man who had never been arrested before. Edward was eventually arrested and charged with gun possession. He is not charged with murder or any other offenses related to the death of the officers. In bond court, Edward received the lowest possible risk assessment scores, yet his bond was set at $200,000-D. This bond requires him to pay $20,000 to secure his release from jail while his case proceeds. Despite being presumed innocent, Edward’s freedom depends on his access to wealth, and that’s not right. It’s also no longer supposed to be true in Cook County. In September 2017, Chief Judge Timothy Evans instituted General Order 18.8A, a local court rule that instructs judges to set money bonds only in amounts people can afford to pay. As a result, more people are being released pretrial without having to pay money bonds, and the average amount of money bonds issued has decreased substantially. 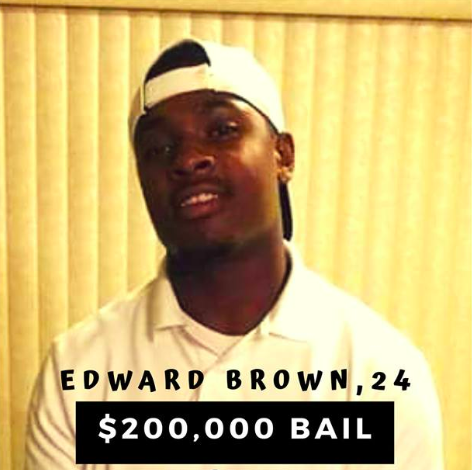 A $200,000 D-bond, however, virtually ensured that Edward would be unable to purchase his freedom and would be incarcerated for months or years while he awaited the trial that will determine his guilt or innocence. CCBF is dedicated to protecting everyone’s presumption of innocence. When the judge in bond court gave him a $200,000 deposit bond, that judge determined that Edward could be released pretrial. The only thing standing between Edward and his freedom was $20,000, a bond amount well beyond anything Edward could afford. That bond was in direct violation of General Order 18.8A and was set to undermine Edward’s right to a fair trial and his ability to participate in his own defense. When Edward’s loved ones realized they couldn’t afford to purchase his freedom, they turned to the community for help. The fact that Edward could not afford to post his bond doesn’t mean that he should have to await trial separated from those who support and love him. CCBF is proud to support Edward and his family as they fight his case.Though the help of a bail fund should not have been necessary, we are proud to have played a role in helping Edward secure his constitutional right to pretrial liberty. Watch coverage from Fox 32 here.